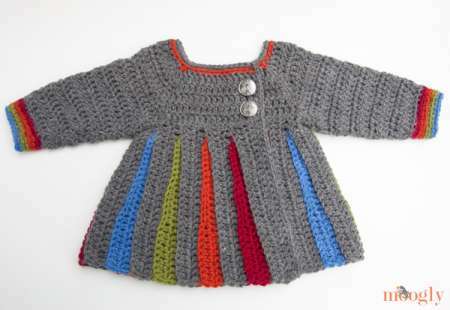 Button One Up For Baby Crochet! This cute sweater caught my attention and took me to the blog of its designer, Tamara Kelly. This one is a freebie. But, I went poking around the blog to find other crochet patterns. I fell in love with the ‘pleats’ that offer the opportunity to insert panels of color – yet another way to use up those partial skeins we all have on hand. The simple neck edging and just the right buttons set off the design nicely. This one isn’t free, but it also caught my fancy. This is the Sven Sweater and the pattern can be quickly downloaded upon payment. I love the colorway and the hood to keep those tiny ears warm. There are plenty of striped baby sweaters out there. I love the way this designer uses the deep red color to make the other colors pop. It’s a nice contrast that will work nicely for a boy or girl. Also on Tamara’s blog are some really helpful tutorials, both photo and video. Check out this blog. You’re sure to find goodies there that will please you! How Sweeeeeet, Jd! I’m drooling over the hoodie! In blues, possibly reds, it would work for my grandson. BTW: He loves Pink! Nothing wrong with that, having 3 older sisters, 1 having an obsession with Pink and any kitty prints! You hit my sweet spot with this one. Thanks ever so much.